Each oral presentation has a 30 minute time slot (25 minutes for presentation, 5 minutes for discussion). Presenters may spend 20 minutes on presentation and 10 minutes on discussion if they wish to spend more time on discussion. There is a 5 minute break between presentations for preparing for the next presentation, but it will not be used to extend the previous discussion. Please follow the chairperson’s instructions to be on time. Poster session is 90 minutes. Please put up your posters on your designated poster board by the time session begins. Posters with odd ID numbers will present in the first 45 minutes of the session, and those with even ID numbers will present in the latter 45 minutes. Presenters may stand in front of their posters for the full 90 minute session, or only for the designated 45 minutes. Poster board size is 180cm high and 120cm wide. Each presenter will be given a pointer and a roll of tape for putting up their posters. Please give sufficient consideration to the adjacent presenters (e.g. use headphones to demonstrate sounds to the audience). There will be no power supply in the conference room. Presenters with underline are eligible presenters for Best Presentation Award. The awarding ceremony for this year’s Best Presentation Award will be on Day 2 (Sunday, September 29th) after the general assembly. Candidates are expected to participate in the ceremony. 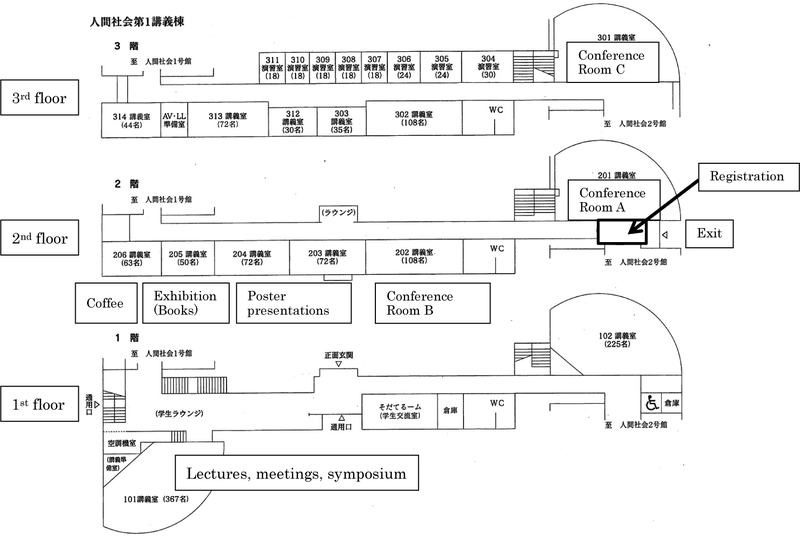 Proceedings will be on sale at the registration booth (1000 yen for students, 2000 yen for members, and 3000 yen for non-members except students). Those presenting at the convention are asked to purchase the proceedings as participation fee. Students of undergraduate and graduate schools must show their student ID at registration. Proceedings on USB will also be on sale from this year as trial. The price is the same as paper-based proceedings. The number of USB proceedings is limited. Proceedings will be on sale only at the convention venue. The public lectures and public symposium is open to anyone. Handouts will be distributed at registration. If you wish to become a member, please register at registration. Membership fee (7000 yen for members, 4000 yen for student members) and admission fee will be free of charge due to promotion. The convention party will be held on Day 1 (6pm, Saturday, September 28th) at first floor of the North Campus Store and Restaurant. Participation fee is 5000 yen for members, 3000 yen for students. Please make a reservation by preferably September 20th by sending your name and membership status (student member, non-student member, non-member) to psj.party2013@gmail.com. Participation without reservation will only be accepted when there is vacancy. Pre-registration is strongly recommended. The venue will not provide lunches on the two days. The cafeteria (located on the second floor of Student Union Hall, open from 11:00am-1:30pm) and convenience store (located on the first floor, open from 9:00am-2:00pm) will be available only on Day 1. There are no restaurants or stores near the campus, so please bring your lunch to the venue on Day 2. 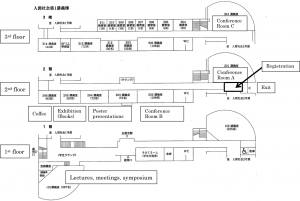 The nursery room is available during the convention with the cooperation of the venue. The fee is at a reasonable price (500 yen/hour for one child). Participants with small children are encouraged to use this system. Please make a reservation in advance if you wish to use this system. The deadline for making reservation is 5pm, Tuesday, September 10th. Please send an email to psj-hoiku@nacos.com if you would like to make a reservation or ask for further information. Books and acoustical instruments will be exhibited on the two days in Room 205. Participants will be able to use the wireless LAN “eduroam” for off-campus users. Technical support will not be provided at the registration booth. 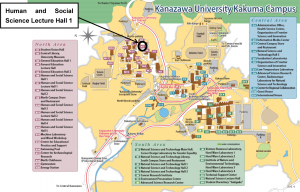 Please take a look at the eduroam JP manual for setup. There will be a lecture on the day before the convention co-hosted by NINJAL. Please see the ASJ website for further details. 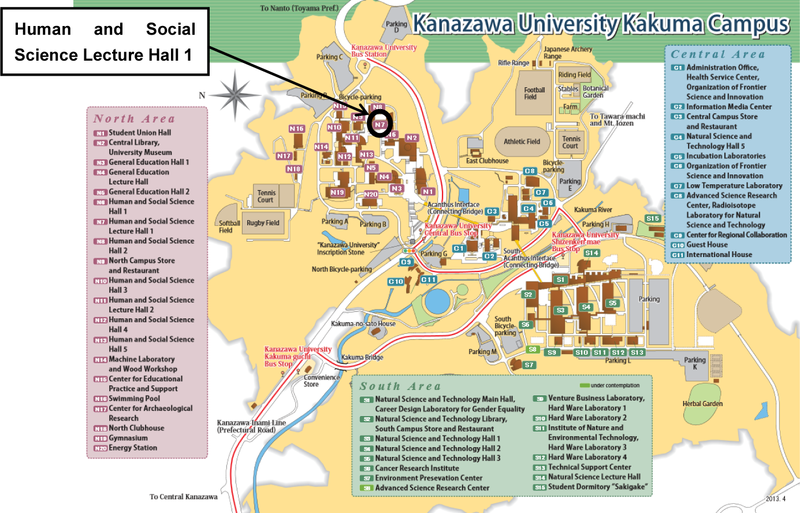 *The venue is at Kanazawa University, Kakuma Campus, North area, on both Day 1 and 2. Please get off at the last stop “Kanazawa Daigaku”) (350 yen). Please do not get off at “Kanazawa Daigaku Shizen-ken mae” or “Kanazawa Daigaku Chuo”. There will be more buses running than usual. Further information will be announced on ASJ website in September. Around 3500 yen from Kanazawa station.